I’m a seasoned traveler. A veteran. I have a routine and it’s an adaptable platform since conditions change. I roam the world’s busiest airport with a purpose. And it can piss me off when people don’t have the same sense of purpose. What’s the point of every action you take and thought you have in the security line? Keep the luggage flowing through the X-Ray machine. Feed the monster. Be prepared. The world knows you take off your shoes and metal junk. Your laptop goes in a tray. And if you’ve got PreCheck then just put your gear on the belt and walk. Then there was the lady this morning. She packed her laptop at the bottom of her suitcase. She had to dig it out and held up the line behind her while she clumsily picked up all the shoes and clots she dropped in the process. Then she repacked the whole thing on the other side as the machine ground to a halt again since there was nowhere for the scanned bags to move to. I mean, who does that??? Then, she turned around in circles acting completely lost as she walked out of the security area. COMPLETELY LOST!!! It struck me, of course, that she was indeed completely lost and had no idea what to do. I pushed the Mad Max road warrior out of my head and asked her if she needed help. She sure did, she was headed to the C Gate. For those who don’t know, at Hartsfield-Jackson in Atlanta C is a concourse and has 57 gates according to the map. There are Concourses A-F plus T gates at the Terminal just to alphabetically mix things up. I explained to her that she needed the gate number too in order to get where she was going. It was on her boarding pass but she was only focused on part of the problem. Then I pointed out where the signs were and led her to the escalators down to the trains which would, in turn, get her where she needed to be. As it turns out, she hadn’t flown in about 5 years and likely not that much before then. 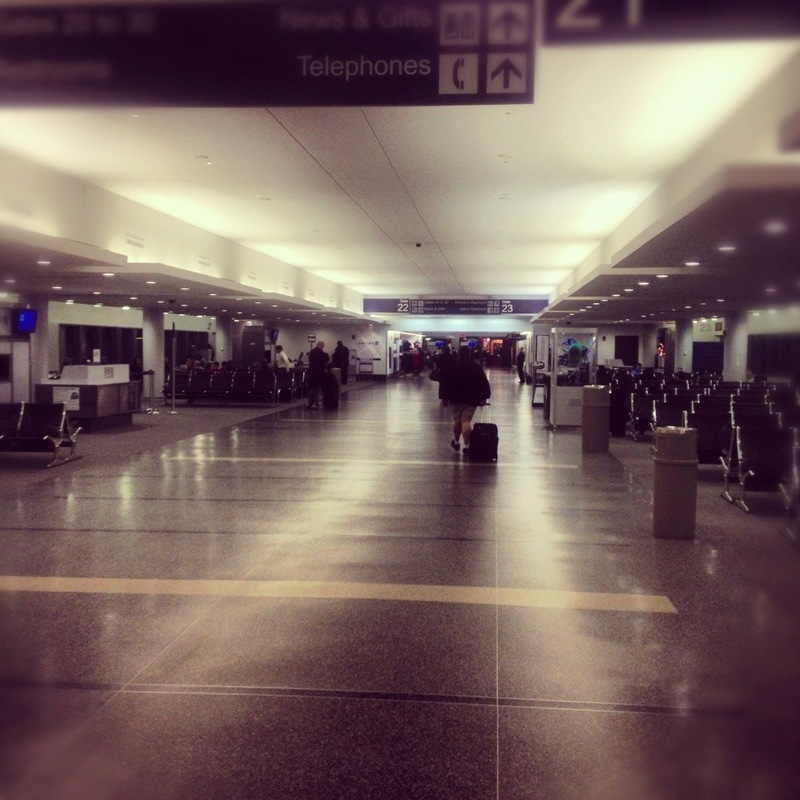 The airport is a huge and complicated place with a lot of places that happen to look the same. She got where she was going with a little guidance and being put on the right path. Have you ever seen the video This is Water? It’s a creative video over a commencement address by David Foster Wallace and is very watchable. It helps put this experience in perspective far better than I can. Give it a watch then read my summarization below. It’s so impactful that I didn’t even realize I was living one of those moments until I remembered the video as I was about to board my highly delayed flight. I’d like to think there are a couple lessons here. Lesson number 1. Before you go into a new situation, do some research. Have a good idea of what’s going to happen if at all possible. Look around for some guidance. There may be information staring you right in the face. There may also be people who can give you good pointers. Then you can help yourself by not feeling completely like a fish out of water. Lesson number 2. Don’t be so caught up in yourself that you don’t take the opportunity to help someone out. Most people aren’t going to be as adept as you are when it comes to your super ninja specialty skill. You’re not that good at everything you do. Even if you are (and you’re really not), you’ll eventually bump into an area where you’re thrown for a loop. Do you want to turn around lost like the lady at TSA, or do you want a helping hand? A little planning and empathy can make almost any journey go more smoothly. You go on little journeys every day of your life. If you expect to walk out of your house every day and have the world let you down then it and everyone on it surely will. If you step forth knowing that there are people who’ve got it all together, others who need a bit of a hand, and together people just having a crappy day, then you’re prepared to take on reality with a better attitude. The daily journeys will grind on you less. If you make this a part of who you are then it can impact your life in a big way. As the video says, it’s a choice. And that choice is yours. Previous Previous post: What Puts the “Smart” in “Smartphone”?